Before we get to Sandy’s guest post, we have our randomly selected Beautiful Blooms Card Kit Launch winner. Our lucky winner has won a $50 Voucher to the MFT boutique. Enjoy! I’ve made two cards today, one using leftover parts from the other – don’t waste those bits! And in my video, I’ll show you a few different ways to apply watercolor powders to your work. 1) Dropping powder into pools of water; 2) Picking up powder from a palette or work surface; and 3) Spritzing with water! Watch the video and learn more about watercolor powders on my blog! Makes my heart smile! Needed this for he scientist in my life! Undeniable chemistry is undeniably fabulous! Felicidades … sus tarjetas son maravillosas, elegantes y muy especiales… me gusta su forma de ver el arte de papel… Saludos desde Barcelona. 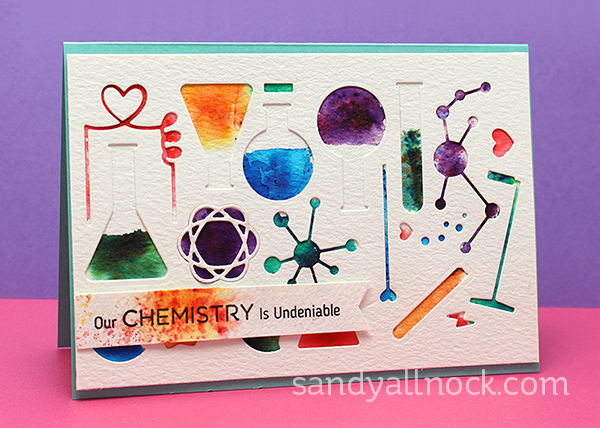 Art meets card making…creative and colorful! What a cute take on science. Love what the girls did with this set. These are just delightful….and I am NOT a scientist! Cute! Love the “science” in this card! 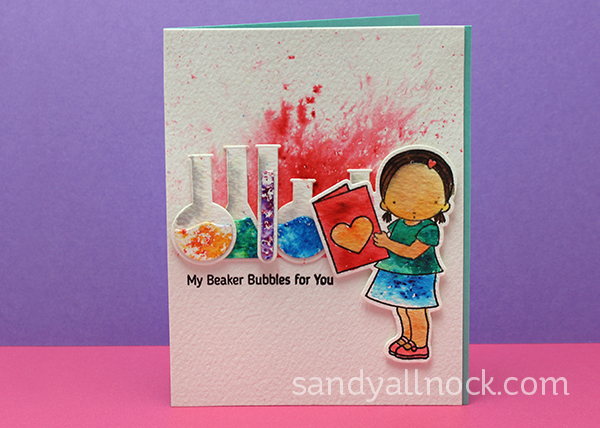 Love these unique cards you have created with the beakers, Pure Innocence, and watercolor powder! The brilliant color of the Brusho is so perfect for these cards! I LOVE them both. Love that these are so vibrant. I absolutely adore your project ideas! This is one of my favorite sets. LOVE your cards! ¡¡¡WWWAAAUUU!!! Me encantaría tener ese kit, es muy bonito y daría mucho juego para hacer muchos trabajos. Too Cute. Everything looks like you did it on purpose. Well, come to think of it, I guess you did. Nice work. wow! love your idea….love mft stamps and dies.